Windows 3D pacman game with 3D dragon maze levels for kids (girls and boys). Free download and play one of the best jumping Pacman game for Windows 7/Vista/XP. 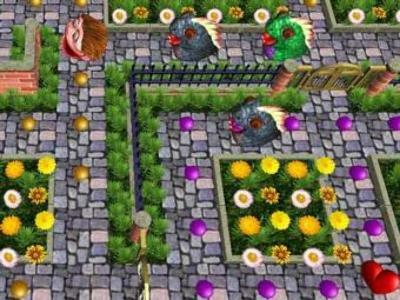 3D Dragon Maze Game is an advanced version of the classic Pacman game for PC. You or your kids will explore uniquely designed challenging mazes, collect bonuses and dots, avoid traps, but you have to run and jump fast because the funny dragons are in hot pursuit of you. The high-quality 3D animation, funny sound effects and wonderful music will immerse you or your kids into attractive game world of one of the best Windows Pacman games for all ages. You and your children will like this funny dragon game. Try it for free now! The goal of 3D Dragon Maze Game is to use the arrow keys on your computer keyboard to move 3D Pacman, who is out to eat everything in a 3D maze full of yellow and purple dots. When your 3D Pacman ate all dots, you advance to the next level. The game becomes complicated because 3D Pacman must jump over traps and avoid the funny dragons who can pursue and kill him. Every funny dragon has uniquely behavior, including a fast or slow speed, ability to open doors and to jump over traps. You or your kids can even scare some of them to get extra purple dots or lure funny dragons to trap to kill them. Collect bonuses to get extra points and lives. If your 3D Pacman lose all lives, the game is over. If Jumping Pacman manage to eat up one of the apples, he will gain extra power that enables you or your kids to eat funny dragons for a limited time. The keys found in the 3D maze allow your 3D Pacman to open closed gates. This Windows maze game allows you to adjust the game speed to play for both casual players like little kids and advanced users in hard game mode. Before you begin your daily work, you can play a randomly selected level of 3D Dragon Maze Game and raise your brain or set you in a good mood. If you like play popular classic arcade games, you can free try this jumping Pac-Man PC maze game for kids. Dark Dragon is slow, opens yellow doors and can jump over traps. Purple Dragon is fast, cannot open yellow doors but can jump over traps. Red Dragon is very fast, always pursues you, cannot open yellow doors and jump over traps. Green Dragon is very slow, places purple dots, cannot open yellow doors and jump over traps. Trap Trap can kill you or dragons. You need to jump over to avoid it. Blue Gate This is an open gate. A key is not required. Yellow Gate This is a closed gate. You need to have the yellow key to open it. Key You can open yellow gates with this key. 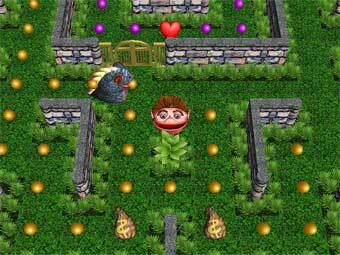 When you buy, full version game for PC, 3D Dragon Maze can be downloaded immediately. A small file size makes it an easy download to your computer desktop. Our ecommerce providers ensures that you get your full version as soon as possible, making purchase based on your own familiar currency and payment method. Free Maze Game Updates are available for minor versions.